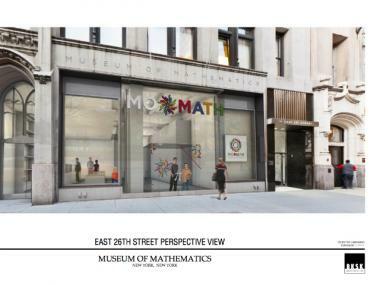 After hearing community concerns that its design was "too modern," MoMath made some adjustments and took its revised plans to the Landmarks Preservation Commission, which voted unanimously to approve the project. 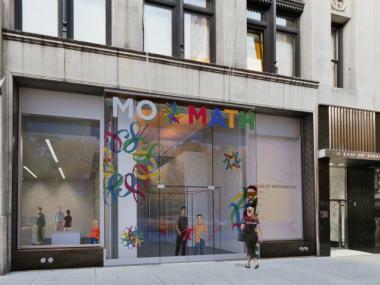 FLATIRON — The Landmarks Preservation Commission approved plans this week to redesign the façade of the new Museum of Mathematics, just weeks after community board members had initially rejected it. The Community Board 5 landmarks committee told the museum’s architects last month that their design for MoMath was “too modern” for the surrounding Madison Square North Historic District. So museum administrators and their team of architects made a few tweaks and brought the revised plans to the Landmarks Commission, which voted unanimously in favor of the project on Tuesday, said Lisi de Bourbon, spokeswoman for the commission. An earlier rendering of the MoMath facade shows more limited bronze detailing and a less unified logo design. The designers made several changes, like incorporating additional bronze in keeping with the historic work on the building. The stone cladding along the bottom of the two windows flanking the museum entrance, for example, was replaced with bronze, said the project's design chief, Tim Nissen. One particular complaint from the community board — that the design appeared “discombobulated”— resonated with the designers, who decided to change the scale and scope of the logo graphics on the front windows to give a more unified look, Nissen said. They also adjusted the placement of a computer screen in the front window, which will be used to advertise museum events, to make it appear more integrated into the overall design, he added. “These are all things that we tried to do to address the community’s concerns,” Lawrence explained. “We don’t want the community to come in and be unhappy. Lawrence said the new design was met with “effusive” praise from the Landmarks Commission during the meeting on Tuesday. Permission to move forward with the façade redesign was an important step in the process of opening MoMath, Lawrence said, but it is not the last one. The museum currently has a permit from the Department of Buildings to begin work on the space at 11 E. 26th Street, Lawrence said. They are still awaiting approval on another permit, however, that will allow them to dig in on more substantial construction. But requests for bids have gone out to fabricators for constructing MoMath’s planned exhibits, she added, and the opening date is still set for late in the year.